NEW YORK – A limited number of tickets to the 2011 NHL Heritage Classic™, the first NHL® regular season game contested outdoors in Canada since 2003, will go on sale on Friday, Dec. 10, at noon ET / 10 a.m. MT via Ticketmaster locations throughout North America and via Ticketmaster.com (at nhl.com/hctickets) as the countdown to the highly anticipated match-up between the Montreal Canadiens and Calgary Flames at McMahon Stadium in Calgary on Feb. 20 begins. The game will feature some of the League’s greatest stars, including Montreal’s Mike Cammalleri and Calgary’s Jarome Iginla. More than 40,000 fans are expected to be in attendance at McMahon Stadium, the home to the Canadian Football League’s Calgary Stampeders on the University of Calgary campus. The 2011 NHL Heritage Classic is the first NHL regular season game contested outdoors in Canada since the Edmonton Oilers hosted the Canadiens at the first Heritage Classic at Commonwealth Stadium on November 22, 2003. CBC and RDS will carry the game in Canada and VERSUS will telecast the outdoor match in the United States. NHL Radio™ will have the live action across North American radio. NHL Network™ will provide pre- and post-game programming, and NHL.com will provide extensive digital coverage. Fan travel packages can also be purchased directly via nhl.com/fanpackages. 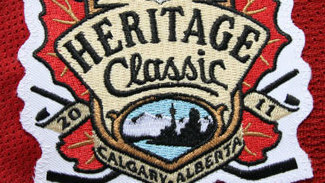 Additional information and news on the 2011 NHL Heritage Classic will follow in the coming weeks. Fans can register online at nhl.com to receive alerts on the 2011 NHL Heritage Classic, as well as other NHL news, events and offers. The NHL Heritage Classic will be the second regular season outdoor game to be played this season, with the Washington Capitals and Pittsburgh Penguins facing off in the 2011 Bridgestone NHL Winter Classic® at Pittsburgh’s Heinz Field on New Year’s Day.